The defining chapter in the greatest Chillogy of all time has arrived. Watch the new trailer for Ice Age: Ice Age: Collision Course, in theaters July 22! Scrat's epic pursuit of the elusive acorn catapults him into the universe where he accidentally sets off a series of cosmic events that transform and threaten the Ice Age World. To save themselves, Sid, Manny, Diego, and the rest of the herd must leave their home and embark on a quest full of comedy and adventure, traveling to exotic new lands and encountering a host of colorful new characters. Blue Sky Studios and 20th Century Fox have released a brand new trailer for Ice Age: Collision Course which brings exciting new footage and the hilarious antics we love and have come to expect from this rowdy crew. Watch the trailer for a new look at this epic adventure starring returning cast members Ray Romano, Denis Leary, John Leguizamo, Queen Latifah, Seann William Scott, Josh Peck, Simon Pegg, Keke Palmer, Wanda Sykes, and Jennifer Lopez and new cast members Stephanie Beatriz, Adam DeVine, Jesse Tyler Ferguson, Max Greenfield, Jessie J, Nick Offerman, Melissa Rauch, Michael Strahan and Neil deGrasse Tyson. Way back in early November, 20th Century Fox released the Ice Age short Cosmic Scrat-Tastrophe. 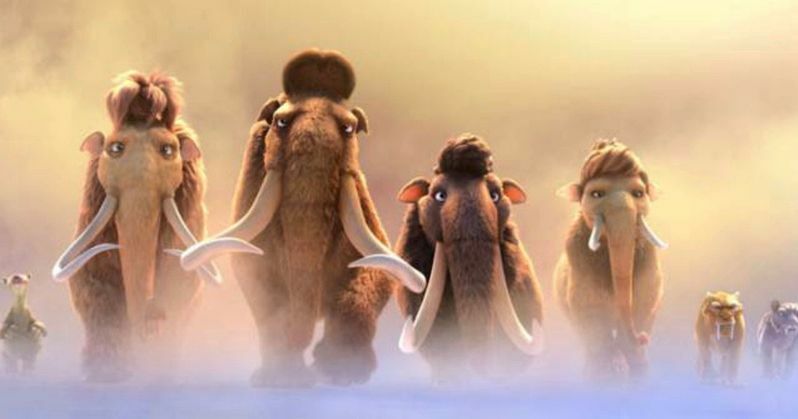 It sets up the events that will be seen in the sequel Ice Age: Collision Course. Now, we get to see the repercussions from Scrat's journey into the cosmos. And it does not look good for our Ice Age pals. How will they ever survive this sudden climate change that is facing Earth! If this trailer isn't enough for you, we have also included the Cosmic Scrat-Tastrophe short. It shows how Scrat and his ol' illusive acorn found there way into space. This epic animated adventure promises 'one small step' which obviously leads to 'one giant mess'. Scrat's adventures have certainly caused a lot of problems in the past. But this latest blunder could wipe out a whole family favorite franchise! We still have 5 months to go before Ice Age: Collision Course is in theaters, but it is sure to be one of summer 2016's biggest hits. The original Ice Age opened in 2002, earning $176.3 million at the domestic box office before going on to earn $383 million worldwide. It was followed by three more sequels, which have taken in more than $700 million. The film will have some strong competition when it opens this July. Arriving on the same day is Star Trek Beyond and Knights of the Round Table, which will both pull in large family audiences. But Scrat isn't afraid of Kirk, Spock and King Arthur. Take a look as this prehistoric rodent continues to get his nut in this first official trailer!